NOTE: A few blogs and organizations — and potentially a newly forming network — post wide-ranging resource lists on multiple forms of abuse, characteristics of abusers and enablers, recovery resources, and dealing with toxic organizations. At this time, I will only be posting on this page a few links to wide-ranging resource pages, plus index resources that I have developed. Hopefully, others can produce a comprehensive listing of sites that address particular kinds of abuse issues, situations, or organizations within the Church. As noted above, at this time I am only posting a few links to resource pages from other organizations that address multiple forms of abuse and resources for recovery. Some of these sources have apparently not been updated in a while, so please keep that in mind. Church Exiters – Abuse Resource Network Page. The Abuse Resource Network is a now-defunct coalition of individuals dedicated to resourcing those recovering from various forms of abuse and violence. It previously had its own website, but the tech person was no longer able to maintain the site. So, the content was transferred to the Church Exiters website of Barbara Orlowski, whose doctorate project focused on ministry leaders who were survivors of spiritual abuse in churches where they served. Includes sections on biblical equality, spiritual abuse, physical abuse/domestic violence, sexual abuse by clergy, and sexual abuse of adults. Spiritual Sounding Board Resource Page. Julie Anne Smith has been blogging since 2012, and her site covers a wide range of abuse situations. The SSB Resource Page includes sections on websites, podcasts/messages, private online forums, specialized counseling in abuse recovery, domestic violence, mental health and the church, sexual abuse, clergy sexual abuse, wives/ex-wives/family members of pedophiles, First Amendment issues, and stalking. There is a vast array of resources available to help survivors recover from any of the many forms of abuse, violence, and trauma. These include publications, survivors blogs, websites of relevant organizations, support groups, online forums, etc. It is beyond the scope for the purpose for this website and my capacity to try to vet and review all those possibilities. On this website, I have attempted to create a place that focuses on research-based aids related to toxic system and abuse issues generally. In terms of general resources for recovery, survivors of many sorts of abuse, violence, and toxic systems will find the first two volumes in my Futuristguy’s Field Guides Training Series helpful. These first two volumes detail topics in deconstructing abusive systems. Each Field Guide has a text portion that lays out concept frameworks and practical solutions. Workbook sections include movies or other media as case studies that show what the concepts look like. Every chapter also includes personal reflection and group discussion questions, and some chapters also have teamwork activities and learning exercises. This material is based on my personal experiences of surviving abuse in church and ministry contexts, plus case studies in other kinds of abuse and resistance movements, both recent and historical. On resources for specific forms of abuse, most of what I have to offer relates to spiritual abuse — misuse of authority in the context of churches, ministries, and religious non-profits. These are available on my main futuristguy website. I would particular recommend the following pages, many of which will link to other articles I’ve posted, and give a summary description of the article. Many of us who survive abuse or violence commit ourselves to do whatever we can so that what happened to us does not happen to others. I use the term support advocates to describe those who serve the causes of change by offering personal friendship, support, counsel, and encouragement to victims. Social change activists describes those who work more at the social and institutional levels, such as public resistance, media and/or research work to spotlight abusive individuals and institutions, lobbying, social entrepreneurship, and the like to catalyze change and sustain movements for holding perpetrators and enablers accountable. The following tutorials are available on my main futuristguy website. These particular pages would be most helpful for support advocates and social activists, in working collaboratively to effect change in situations of systemic abuse. Some of the material in these tutorials will appear in the Futuristguy’s Field Guides Training Series, mostly in Field Guides #3 and #4. These second two volumes detail topics in how to construct (or reconstruct) systems that are robust and sustainable. These are activities that survivors, advocates, and activists can all take part in, to make a difference in this generation for the benefit of those who follow. Volunteer and on work staff with non-profit organizations since 1972. Studies of authoritarian cultures, dissent, and resistance since the mid-1970s. Writing and editing resource materials about abuse, violence, and toxic systems since the mid-1980s. Intensive training on skills of futuring (strategic foresight) in the late 1990s. Blogging about spiritual abuse and recovery in depth since 2007. Group 1: Survivors – survivors of abuse, those who support them as personal advocates, and those who take up their cause as social activists. Personal experiences and relationships networks motivate them to expose and challenge toxic systems, and hold accountable those who are responsible. Group 2: Investigators – students of history, culture, and strategic foresight (futuring). Students of the sources and pathways of systems, and how actions toward transformation affect their potential trajectories. Group 3: Builders – change agents: social entrepreneurs (issue-oriented), community developers (place-oriented), and help/health professionals (people-oriented). Project and organization designers, implementers, evaluators, and revisers who facilitate dismantling systemic abuse and replacing them with constructive social systems. The training series is not geared to any particular issue of systemic abuse, but shares concept frameworks and practical skills that provide an overarching strategy for action. And some Field Guides in the series may present material more directly relevant to this or that group’s experiences and expertise. However, when all three groups collaborate, their synthesis amplifies the possibilities for transformation of systemic problems. So – what might these very different groups likely draw from the series, and contribute in turn to the whole as participants in social transformation efforts? Group 1: Survivors. This series helps them understand what happened to victims of abuse/violence, why it was even allowed, how people were conditioned to let it happen (or make it happen), how it was covered up, and how to help survivors recover. As insiders to the impact from systems of abuse, their narrative helps the Investigators discern patterns, and they can help Builders as witnesses about what happened and as consultants about culpability. Group 2: Investigators. This series helps them study the cultural, organizational, and spiritual “DNA” of healthy versus toxic individuals and institutions. They interpret this information to figure out the parameters (degrees of freedom or restriction) for transformation of those individuals/institutions. This helps stakeholders (Survivors) and shareholders (Builders) on social enterprises discern their preferable pathway forward, out of many plausible scenarios. 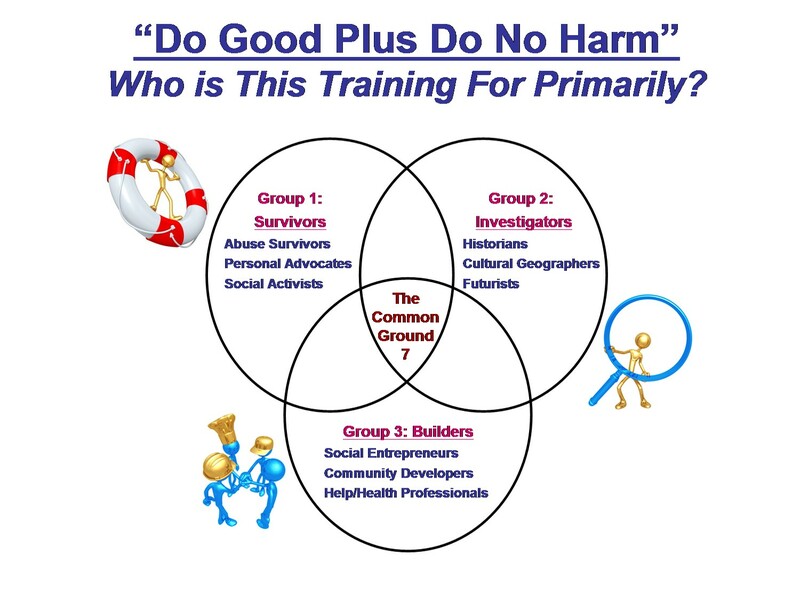 Group 3: Builders This series helps them apply principles and practices – often distilled by Investigators – to prevent agenda hijacking and organizational toxicity in their own projects, challenge systemic abuse toward transformation, and facilitate individuals toward recovery and flourishing. And, if they’re addressing systemic abuse, they’ll need to include the insights from Survivors, since they are insiders who’ve survived misconduct in particular systems. All three groups benefit by working together on issues involving systemic abuse. In fact, I believe we’re not likely to succeed in dissolving such systems unless we collaborate. Then it is far more possible to take down systemic abuse and replace it with systems of justice that support victims, protect the vulnerable, and face agents of damage with consequences for their actions and inactions.